The Nephrogenic Diabetes Insipidus (NDI) "Foundation was formed to support education, research, treatment and cure for Nephrogenic Diabetes Insipidus." 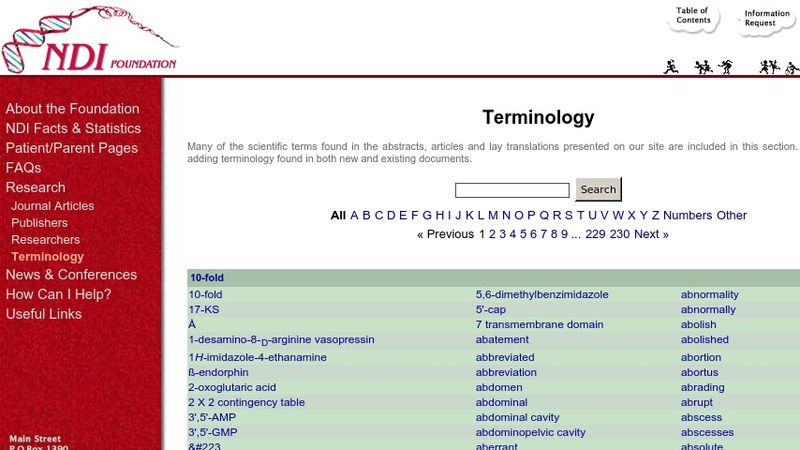 One notable NDI Foundation website service is a sizable glossary of medical terminology with definitions for such terms as apoenzyme, basal nuclei, neuroglia, valine, and many more. The website also contains numerous abstracts of related journal articles. The article references and abstracts can be located by browsing extensive lists organized by Date, Author, and Journal. In addition to abstracts, some of the article references also link to less technical Lay Translations. The Foundation has requested permission from publishers to display full-text articles, and some of these versions are currently available as well. The referenced articles span more than a decade, and have appeared in such journals as _Endocrinology_, _American Journal of Physiology_, _Journal of Biological Chemistry_, and _Nature_, to name a few. An additional website service is the Researcher Directory which lists related researchers alphabetically, as well as by Institution, and Country.